Initial process concentrated on word mapping. Went through the thesaurus to find synonyms and adjectives of the word blue to try and build a schema for creative direction. I explored faith a bit more in detail and mapped out a series of words that derive from faith. My extended list consisted of truth, religion, proof, trust, honesty, white, unseen, intangible, and various others. After this second iteration of word mapping unseen and intangible appealed to me the most. After this step I went back to conceptualize ideas and developed a back up concept word of cool in relationship to blue. This gave way to a whole exploration and creative process of how to convey this message of unseen and intangible through faith, which resembles the color blue. At the same time I wanted to additionally explore my second direction, which was the cool interpretation of cool. With cool I began to list all of the cool things I have at my disposal that portray and give off a cool atmosphere. I listed some handy items—3 main ones being my iPhone, glasses, and watch. I sketched out what appeared as the spelling of “cool” with my side stance curled watch to resemble a letter “c,” my glasses to take the form of a double “O,” and my iPhone to take the form of a lowercase “l.” At this point the idea seemed to literal so I decided to track back and go with my initial concept of faith. From here I reflected back on what creates faith and the meaning behind faith. Believin without proof is a key point I decided to follow and explore with unseen and intangible and so I immediately thought about who are the most faithful people in this world. One of these groups is the blind. Since they aren’t able to see and prove spoken imagery and descriptions, they must rely entirely on faith in order to trust and believe what they can’t see. Knowing that this is a visual handicap I immediately thought through some ideas of how to translate this idea into my direction and execution. As I went through this main idea of conveying the message that one of the most faithful groups in our society are the blind, I then began to connect negative space with faith, from the unseen to the eyes. This contradictory combination brought about the possibility of utilizing eyes somewhere in the piece. 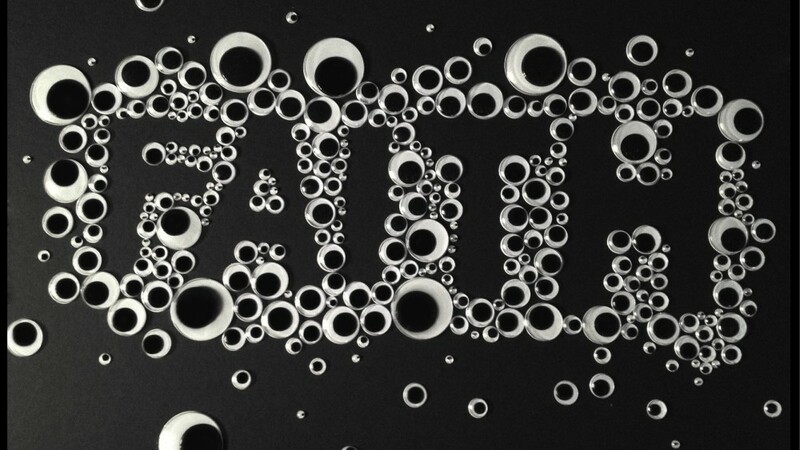 For the second iteration I concentrated on portraying the word faith through a light source. The light source represented hope, something intangible. I omitted the letter I to signify the individuals who possess the most faith—the blind. 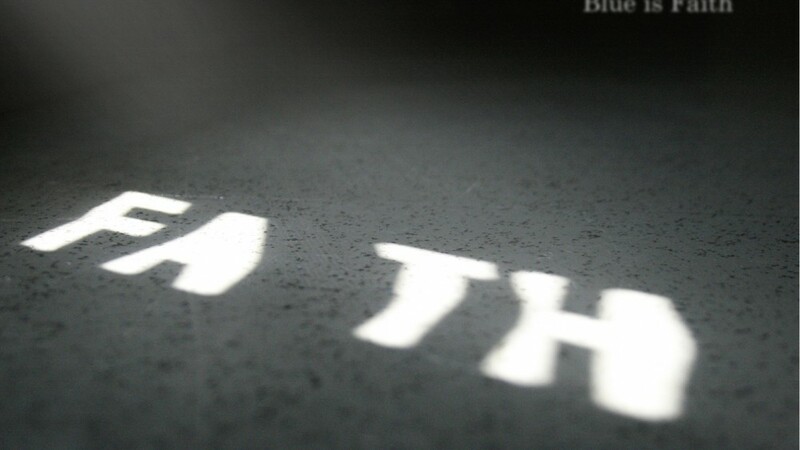 I blurred out the message “Blue is Faith” to channel that experience of trusting and believing. As I filtered through this visual representation I turned to the possibility of using google-eyes to fill in the usual negative space of the letters faith. Subjectively this idea seemed to work and showed great promise as the letter form build out continued. I laid out all of the google-eyes on a black backboard and took a bird’s-eye view shot of the finished piece. For the second round I ventured off in the direction of lighting effects. Had a cut out of the letter forms seen above with the exclusion of the letter I to represent the individual. Allowed the light to pass through onto the floor and rose the camera above the floor about a foot to take the shot. After bracketing this was the best naturally looking shot. No adjustments have been made to this image. This idea represents how our perception of reality is an act of faith. These fragments of ideas and concepts we don’t posses a full range of knowledge of are subject to closure we provide by closing the information gap. That gap/negative space is unseen and intangible. We depend on faith for survival. The second concept required more involvement. The outcome was more gratifying than the initial iteration since it gave more dimension both conceptually and visually.